I've learned two important things today: I can turn my iPhone into a tiny slot machine, and "appcessory" is a word now. 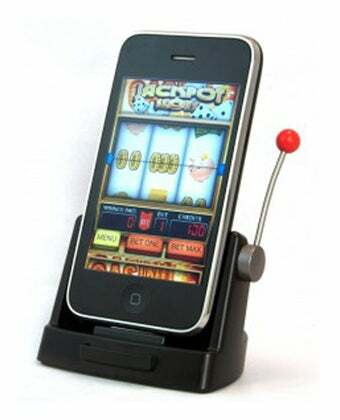 Jackpot Slots—which is both an iPhone app and a dock—just made someone's tech-savvy grandma very happy. The Jackpot Slots dock costs $40, but that includes the eponymous app that gives you access to several different slot games "of varying levels of difficulty." Which I assume encompasses "random luck" and "extra random luck." You can also compete in slot tournaments, win prizes, and suffer your crippling gambling addiction in the comfort of your own home.